Coach Ben Howland calls Arron Afflalo a "warrior", a player who takes more pride in making a defensive stop than he does sinking a three-point basket. "Shutting that other guy out; that's just like scoring," Afflalo says. In one scrimmage earlier this year, walk-on Kelvin Kim was attempting to bring up the ball when Afflalo picked him up in the backcourt - he denied Kim any sort of forward progress and then stole the ball away from him - Afflalo banged his chest and celebrated the defensive stop. He wasn't trying to show up another player but was showing his pride in his defense. No matter whether it is a big game or scrimmage, an opponent's star player or walk-on teammate - Afflalo takes defending a player as a personal challenge to himself. However, this year's Bruin season has been plagued by injuries in the early going. Josh Shipp, the third leading scorer last year, hasn't played a single game due to hip surgery, Jordan Farmar missed the preseason and two regular season games due to injuries, and the center position has suffered multiple injuries. Afflalo has had to step forward on the offensive end - and he has come through for his team. 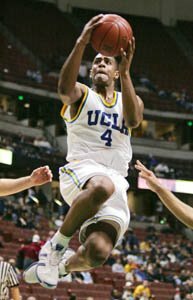 Afflalo is leading the Bruins in scoring with 18.1 ppg on 49% FG% shooting and has made 21-52 three point shots for a 40% clip. Not to mention Afflalo also is the second leading rebounder on the team with 4.8 rpg and leads in total minutes played (283 minutes). Against Nevada Afflalo had 18 points and 8 rebounds yet his performance was overshadowed by his backcourt mate Jordan Farmar who scored 24 points mostly in the second half. Nothing new. Farmar usually gets the attention. Jordan Farmar can usually be found shouting out instructions to his teammates on the court, extolling them on when a crucial stop or rally is needed, or actively working the refs during the game. Farmar is vocal and a natural born leader. Afflalo is a leader too but he provides his leadership differently - he does it by example. By making the defensive stop, taking the big shot when no one else will, hustling back to stop a break, or diving for a loose ball - Afflalo inspires his teammates with his heart and soul for the game. Teamed with fellow sophomore star, Jordan Farmar, they make up perhaps the best backcourt tandem in the country.